The denim on denim trend — or “double denim” — means wearing two or more items of denim in one outfit. In other words, you’ll pair bottoms like jeans, a denim skirt, shorts or culottes with tops like a denim shirt, jacket, vest, tunic or chambray blouse. Or you’ll wear a denim dress or denim jumpsuit. Based on these visuals it’s clear that adding a glam integrity to double denim is a fun way to wear the look. 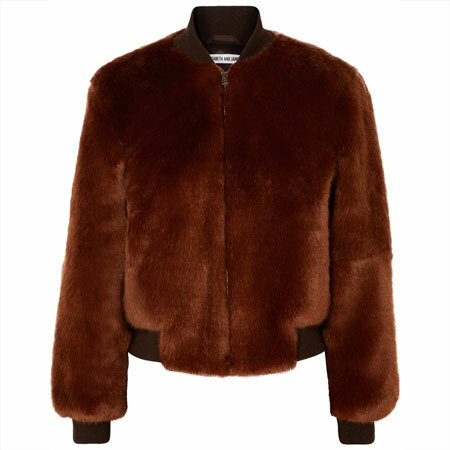 It makes the outfit less masculine, more alluring, more girly, and a lot softer. Here are seven effective styling strategies. Feel free to combine several of the tips in a single double denim outfit. Pair a denim blue top and bottom in different blue washes. Or pair blue denim with white or black denim. Pairing white or black jeans with a blue denim shirt, jacket or tunic is a popular rendition. Chambray is a softer and a “denim-lite” way to wear denim on top. Think of a chambray top in all sorts of silhouettes, and not just a shirt. 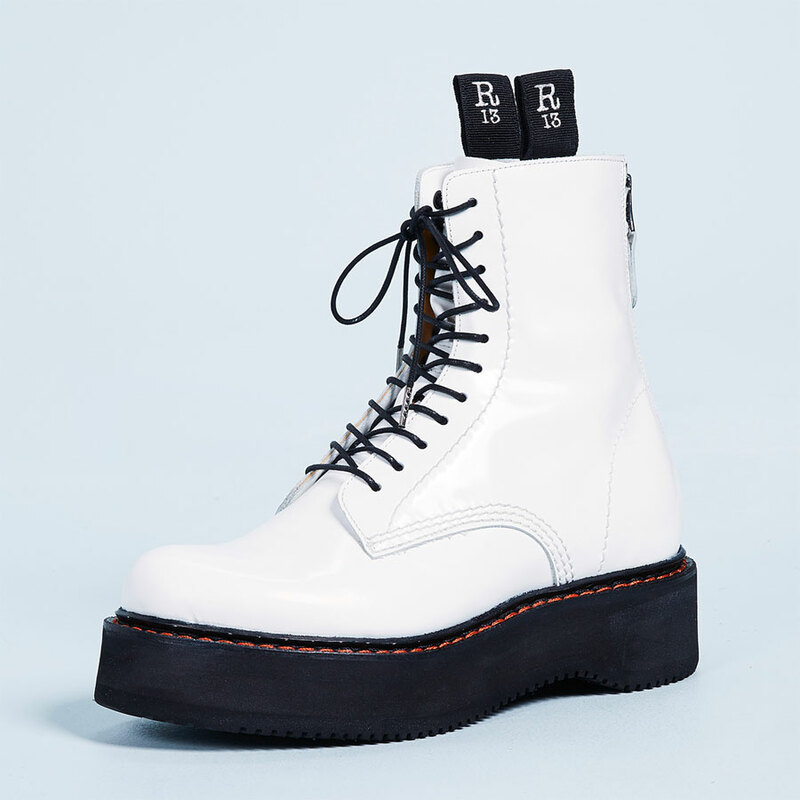 Heels, pointy toes, ankle straps, pumps, cage heels, strappy sandals and any other shoe style that’s NOT Tomboy. Metallic footwear creates a nice juxtaposition with double denim because it’s neutral, glitzy and bright. Unbutton the front of a denim shirt a little lower and showcase a lace camisole, or a bit of lacy bra if you dare. Scrunch long sleeves to bare forearm skin. Combine a sleeveless top with a vest. Wear a denim mini skirt, or a longer skirt with a high slit. Or showcase shoulders with an off-the-shoulder top. Add shiny jewellery to create a textural layer against the denim. Add a dressy and structured bag. Fingernail polish, toenail polish, and make-up adds that next layer of glam to the outfit. Wearing snug jeans increases the alluring-factor of the outfit, and offsets the fluid fit of the top. Although fashionable, combining baggy boyfriend jeans with a roomy denim boyfriend shirt or denim jacket and chunky flat oxfords does not have the same girly and glam effect. Layer jackets or vests over a column of colour to break up the expanse of blue denim. Toppers can be fitted, fluid or oversized. You can even add a denim jacket in a contrasting wash to the column of shirt and jeans. I’m back to loving double denim. I wear blue denim dresses. I wear blue denim tunics with fitted cropped white jeans. I wear a blue denim shirt (or jacket) with fitted cropped white jeans, and have also worn them with fitted cropped blue jeans and a snug blue denim skirt. I now make a point of adding heels, a structured bag and pearls to the outfit to glam things up. Over to you. Do you wear double denim? Great ideas on how to wear double denim. I love denim but am always worried about wearing more than one piece at a time. I will try some of these ideas out. I like the look on others. Yes! I’m in! Especially a denim shirt with white bottoms. Have done it and will repeat. Your street style shot of statement white jeans and dressy bag and shoes really calls to me! I may try that with my white flares and my chambray shirt. I’m in! I like a blue chambray top with white jeans ALOT. And when it’s hot, I love denim shorts. I also LOVE my new denim dress. But….what if my shoes are denim? Does that count? I hope it does! I think I could manage white or dark jeans with a chambray top. I’m not sure that double denim is central to my style, but I have been wearing light wash and white denim together (although my one remaining pair of white jeans may be unsalvagable with dye transfer — ugh), and I love wearing my unlined chambray blazer with close-to-matching light wash crops, or dark bootcuts. I like this look better than a chambray shirt on me. Maybe I should add a bit of bling! I do double denim light occasionally, usually with white or indigo denim and chambray. I like a column of denim look, like a jumpsuit, but don’t have a great way to create that now. A non-button denim top to wear for cool weather would be great. Denim has an irony for me as I especially like the idea of it for my extra casual summer lifestyle, yet it is too heavy. That’s where chambray is helpful. Off to check out all the photos. I think I could become more clever about this with inspiration. Thanks, Angie. No, never found a chambray shirt that appealed to me – not actively looking for it either. I don’t like denim jackets. Another white denim and light blue chambray shirt wearer :-)! Also well fitting white denim and dark blue denim jean jacket with sleeves rolled…showing a little skin! Love the visuals,great inspiration – thanks Angie! This is extremely helpful; it’s the details that make a big difference in how this trend looks and feels, and I often miss the details! I wore denim on denim the other day and I couldn’t quite figure out what was off with the outfit. I will go back to the drawing board with this information to see how I can improve. Great tips Angie! My most likely outfit sporting this trend is white jeans and a blue denim jacket. I love the combo. Also, you know, for some reason it had never occurred to me that I could have a chambray top that is not a shirt!…slaps forehead. You see I don’t wear button downs, but I would definitely try a different style top in chambray. Great inspiration pictures! I really like the flouncy peplum shirt, the white flares, and black jeans looks. I don’t currently wear double denim but I’ve been interested in trying the lite version for a while. My 90’s chambray shirt is in need of an update though, it was a workhorse for me that still gets out to play now and then as a layering piece or for yard work. Great article Angie, those little tips help a lot! I really like double denim, but keep forgetting to wear it. I need to fix this, I will impose myself a little challenge and describe it on the forum. I would also really like to find a chambray blouse that is not a button-front shirt, in a completely different cut, like that pretty of-the-shoulder blouse in your first example. I also have a question regarding denim jackets, I have quite a few but all but one are fitted and cropped, purchased mainly to be worn with skirts and dresses. Is there a right way to make them work with jeans too – perhaps over a column of color or with a top tucked into high-waisted jeans? Or is it too difficult and I should just keep wearing them as intended with dresses/skirts. I do it but mostly with mixing a blue piece with black, white or grey denim. Like Eliza, summers, when I most often would like to wear denim, are too hot. I would need sleeveless chambray tops. But sometimes a denim vest can work. These photos are filled with inspiration and I like making denim on denim more girly. I like denim on denim light a lot! For me it is usually chambray shirt/ white jeans, but I also will combine blue denims in different washes. These tips are helpful. Thank you, Angie. Tanya, two of my denim jackets are relatively cropped also. For me the trick is to wear a longer top underneath to adjust proportions. So, one that comes quite a ways below the cropped jacket. It also helps if the top has a curved or asymmetrical hem. Having said that, I know it might be a bit trickier for you since you are taller with a long willowy waist. So a cropped jacket probably looks more cropped to start with, and longer tops may be hard to find! Love the look but never feel comfortable wearing it myself. Don’t think it’s my style, but really appreciate it on others! Thank you For the write up and the visuals. I enjoyed the perspectives and the glam looks. I pretty much live in soft Flowy denim or mixed reconstructed or up cycled denim in the summer. I think I may stray into the Britney Spears and Justin Timberlake during the early 90s Canada Tuxedo realm. I updated my Z.A. love with pictures. I guess my friends that I hang with always say your” vibe attracts your tribe” my tribe is very different from YLG family but I really really enjoy this “tribe” also. Chambray is definitely easier to wear on top than full denim. A denim shirt that’s fitted always makes me feel like I’m fully encased in a jean jacket: stuffed in and constricted. And a voluminous denim shirt is a bit too much like a gardening smock. White jeans with chambray shirt — that might be my late-spring uniform this year. A perfect Chambray shirt in a longer length goes on and off of my shopping list. I really like them on others with white jeans and might like it on myself if I ever find a great one…. This is such an insturctive post, Angie. this is what I love about your posts – you don’t just slap a bunch of inspiration photos up that you like – ypou carefully curate the ones taht are most instructive and then pull out the themes. I never gave denim on denim a second glance (I am a late adopter of trends) but the low buttoned jean shirt and the column of colour really call to me in these. Definitely bookmarking this to try! I’ve avoided this ever since my son critiqued my outfit of jeans and denim jacket. I like a white denim jacket. If fact, I just bought one, and wore it yesterday. I have a denim vest and jacket, and will try them with my denim jeans. I like the inspiration photos. Lots of fun looks. I love the look of denim on denim and need to wear it more often. 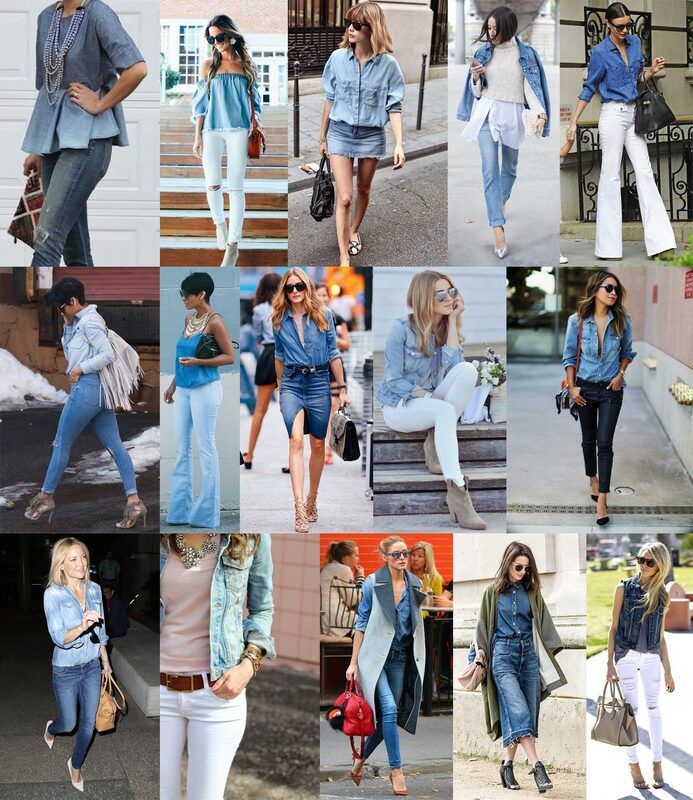 My favorite combo is denim of opposite shades like white & blue or light blue and dark blue. I also like chambray. I really like your examples where they’ve added some bling. I love the Magically Matchy-Matchy inspiration photo! These are great tips, Angie, I'm taking notes. I really like sporting the double denim look, and enjoy wearing my dark blue button-down tunic with white jeans. I also can't wait to experiment a bit more with my new light wash denim jacket. I also love the idea of sporting double denim with a top or blouse that is a little different from the classic denim or chambray button-down. Will have a look around to see what is out there right now. I almost never wear double denim, mostly because the only non-pants denim I own are two cropped denim jackets, and I don’t like them with jeans. I don’t see that changing anytime soon. However, surprisingly (to me) I like the look of many of these, particularly with the different shades and textures. I’m looking forward to seeing it on forum members! Another white jeans with chambray shirt wearer here. I really like the look of the shirt with the white flares. Great color and appears to have a nice drape, more sophisticated than my basic chambray button up. I’m not into double denim – and it’s your fault Angie! Back in the early YLF days you were against it and it is hard to change my mind back. 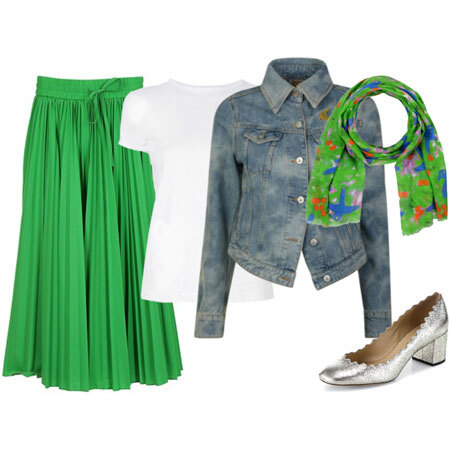 I think I’m going to try my chambray shirt with my slim white bermuda shorts – I haven’t been wearing either often enough and it seems that with the right shoes, handbag and jewelry, it could be a good way to wear both items more often. I love all of these tips. Thanks, Angie! I am another devoted wearer of white jeans with a chambray shirt. But these pics are all fab and they are emboldening me to take the all-blue-denim plunge! Thanks for another great post, Angie! I can see myself (and have) combined white, black or blue denim. Helpful tips to keep from looking too manly. Love all the visuals:) The flares really look great to me. Thanks, Angie! I’ve been surprised at how much I actually like double denim options these days. I think it really helps that we have so many choices of color, pattern, and cut in the tops and bottoms. I have collected 4 different chambray/denim shirts, though so far they are all definitely shirts vs. blouses or “tops.” Also surprised by how much I am enjoying a wild card buy of some patchwork jeans! Had not planned on that one at all. Yep, I like the approach of two distinctly different colors or washes, as evidenced by my outfit yesterday! It suits my casual life very well. Thank you for this very helpful breakdown! This makes me want to add denim or chambray tops, and a denim jacket, to my wardrobe. So many fun double-denim possibilities. I like the potential for combining feminine and androgynous in one outfit, too. Oh, but excellent tip to glam it up to make it more feminine and less home on the range. That really works as you can see in the pics. buttondown shirt with black or gray denim jeans. My favorite double denim outfit was a “shades of blue” look. I wore a light denim jacket, blue long drapey tee, darker blue jeans, and navy sneakers. Then a necklace with a blue print pendant. I loved it! My fashion-savvy son agreed. Fun to hear you inspired by double denim, ladies. Your outfits sound great. Tanya, as Suz suggests, try a longer low contrast top under the short denim jackets, and pair it with denim CROPS to keep all proportions short. Your own suggestions will be fun to try too. Thanks for the kind words, Roxanna. Inge, chambray tops are pretty, aren’t they. HAH! Anne. You crack me up. Actually, that’s not entirely true. Was always into blue denim paired with white denim, and sported a column of colour regularly too. You will see very old WIWs showcase these combinations. Was not much into the denim shirt paired with black jeans though. Too ‘90s for me. Another fan of the denim on denim look here…especially involving different washes. I’m glad this look has taken off since it’s so useful for those of us with a casual lifestyle. 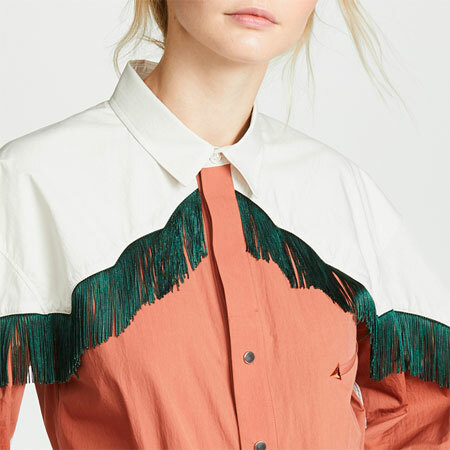 It’s so interesting how purposeful styling rather than mindlessly tossing on any old denim shirt and jeans (the “Texas Tuxedo”….did anyone use that term?) makes all the difference! I don’t, but I’d like to try a denim shirt or jacket with white jeans. Unfortunately I don’t own any denim top-half pieces at present, and it’s not been a high priority in my shopping. I’ll wear double denim, usually in different colors. I don’t usually wear different washes of the same color, though I have tried it. Thanks for the inspiration and tips, Angie! The photos give some great ideas. I occasionally wear DD. Today I am wearing dark wash J Crew ankle jeans with a bright red v-neck tee and an open chambray shirt over the top with casual shoes and some jewelry. Yesterday I wore silver grey J Crew toothpick jeans with a gap navy and white breton tee and a shorter denim jacket over it with a shiny vintage brooch, earrings and flats. I like the looks shown here and will use them for inspiration. I am in love with shirts in the color of pale blue denim or chambray, so I will be referring back to this post! Here in Canada the double denim is often jokingly referred to as the “Canadian Tuxedo”. I likely wouldn’t wear blue on blue but the coloured denim with a nice chambray shirt I could likely work with. FAB visuals! I love that many of these are soft yet still have plenty of structure/tailoring; the glam elements seem to add to the softness, too. Also fun to see so many non-shirt denim tops. I have no problems wearing any wash with any wash, whether that means two blues or mixed shades. Probably wear mixed most often, but am particularly fond of wearing my perfectly matching faded blue jeans/vest together. Although I am not against double denim in principle, I am not sure I ever wear the blue on blue combination. Now I will have to try! I’ve been keeping an eye-out for a boxy denim short sleeve, pop-over, cropped length top all spring to do a column of color with dark wash denim. I’d like something light weight, like chambray, but darker wash if can work with my dark wash jeans. Tried on a fair number of options, but nothing just right yet. Good reminder to try my denim jacket and chambray top with white jeans though! Appreciate the tips. After a childhood spent in South Texas I find it especially hard to embrace double denim. Far too many cowboy tuxedo connotations for me. I might try this look with bling (but definitely no western/Navajo turquoise) and different denim washes. The ones I’m using from this great list are pairing different wash denims (white, red to name some) and in the spring and autum I really enjoy wearing my soft black denim dress and the same one I bought in blue denim, too. 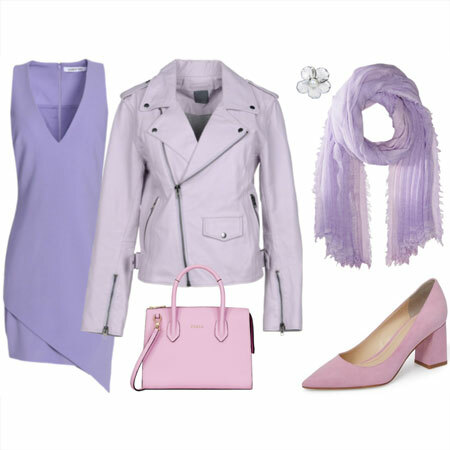 Adding some feminine footwear and nail polish (3 and 5) puts it all together. Tried this the other day and failed miserably. I got asked if I was from some backcountry farm and someone offered styling advice… this is one trend I can say does NOT work on little me.